Years from now, whether that be five or 500, when this formerly green Earth is a post-apocalyptic wasteland, in a perpetual state of nuclear winter to remind us all of where we went wrong as a human population, us commoners will be huddled around fires, reminiscing of the old days. And the rich, well, they’ll be driving these. Perhaps it’s a sign of the times or perhaps it’s just me, but every time I see an absurd off-road vehicle like this restored Land Rover Defender or the apparent renderings of the new Jeep Wrangler pickup truck, the Gladiator, I think about how capable of an apocalypse vehicle they’d be. On a scale from one to 10, this Defender would be out of my price range for the coming apocalypse, therefore I’m not going to rate it. But this Defender modification is for present times, for now, and it comes from a custom Defender restoration shop called Arkonik. The shop has a website tab for interested buyers to pick their budgets, which range mostly from $120,000 to $150,000 on a 16- to 18-month waiting period. 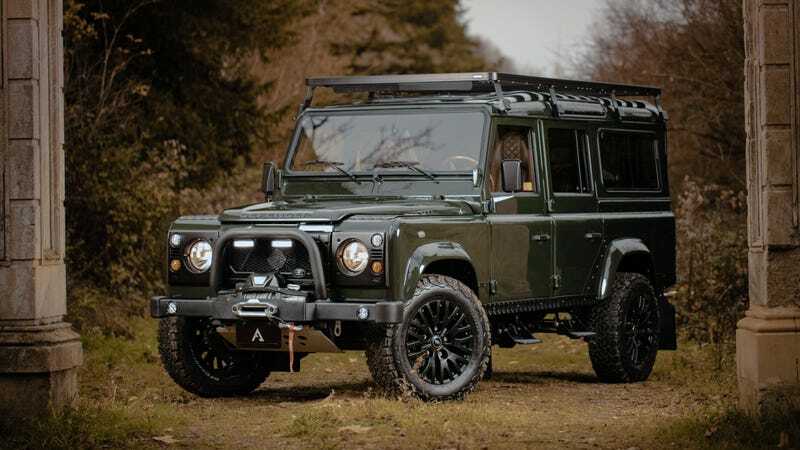 This restoration began as the old Land Rover 110 Defender model, to be exact, and Arkonik went and made it ready for a luxurious ride into post-apocalyptic life. The rest of us, well, we’ll probably see one through the rubble and veil of our regret every once in a while and think it’s a rescue vehicle of some sort. But it’s not. Nope. It’s this sucker again, tackling the apocalypse with diamond-quilted seats and diamond-quilted everything and room for the whole family. Be sure to wave as they drive by.